880 pages | 42 Color Illus. | 127 B/W Illus. 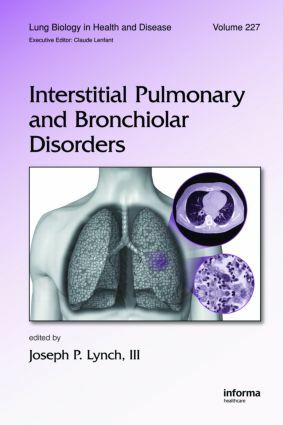 Removing the guesswork associated with Interstitial Lung Disorders (ILDs) and bronchiolar disorders, Interstitial Pulmonary and Bronchiolar Disorders addresses the issues faced by pulmonologists in treating these disorders. Divided into sections based on the disease type (granulomatous, pneumonias, bronchiolar disorders, vasculitis, and orphan lung disease), each disorder is covered from epidemiological, pathogenic, clinical, and radiographic perspectives. Approach to patient with diffuse interstitial lung disease. Thoracic Imaging for Diffuse ILD and bronchiolar disorders. Bronchoalveolar lavage. (BAL) for Diffuse ILD. Genetics of ILD. Pathology of Diffuse ILD. Immunosuppressive and cytotoxic drug therapy for Diffuse ILD. Sarcoidosis: pathogenesis, epidemiology. Pulmonary Sarcoidosis. Extrapulmonary sarcoidosis. Hypersensitivity pneumonitis. Berylliosis. Hard metal pneumoconiosis. Silicosis and Asbestosis. Idiopathic pulmonary. fibrosis (IPF). Nonspecific Interstitial Pneumonitis. Respiratory bronchiolitis interstitial lung disease (RBILD) and desquamative interstitial pneumonia (DIP). Acute interstitial pneumonia (AIP). Lymphocytic Interstitial Pneumonitis (LIP) and other pulmonary lymphoproliferative disorders. Collagen-vascular disease-associated pulmonary fibrosis. Other pleuropulmonary complications of CVDs. Cryptogenic Organizing Pneumonia (COP) and other causes of organizing pneumonia. Obliterative bronchiolitis: classification, causes, overview. Obliterative bronchiolitis following lung or heart-lung transplantation. Pulmonary complications of bone marrow transplantation. Pulmonary and airway complications related to September 11th. Pathogenesis and Epidemiology of ANCA-associated Vasculitides. Wegener’s Granulomatosis. Churg-Strauss Vasculitis. Microscopic polyangiitis. Pulmonary Capillaritis. Anti-GBM antibody disease (Goodpasture’s Syndrome). Behcet’s Disease. Eosinophilic pneumonias and syndromes. Langerhans cell granulomatosis (LCG). Lymphangioleiomyomatosis. Pulmonary alveolar proteinosis (PAP). Pulmonary and tracheobronchial involvement with amyloidosis. Drug -induced pulmonary disorders.